Those Last 75 Pounds: Registered!! 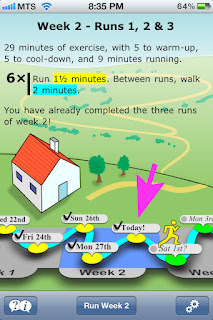 I mentioned in my last post that I experienced some knee pain on Monday's run. It started about halfway through the run in both knees in the same spot. I suspected either that I was weak or that it was my shoes. Last night, I had a massage and she mentioned that my hamstrings were really tight. I took special care today to warm up, then stretch, then run, then cool down, then stretch. 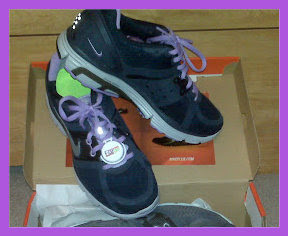 I also tried my "newer" running shoes today and I felt great. No pain. By "newer" I mean, that I used them for about a month before my ankle injury and then since then, they've just been sitting in a shoe box all sad and lonely. Ironically enough, the day after I was experiencing knee pain, I got my monthly email from Runner's World magazine and the title was "A Strength Routine to End Running Pain". Well well, what nice timing you have RW! I scoped the website and there is a plethora of exercises as well as videos specific to each important part. Excellent resource and I'm definitely going to add some of the exercises and take more care with stretching. And here we are with . . . TODAY'S RUN! 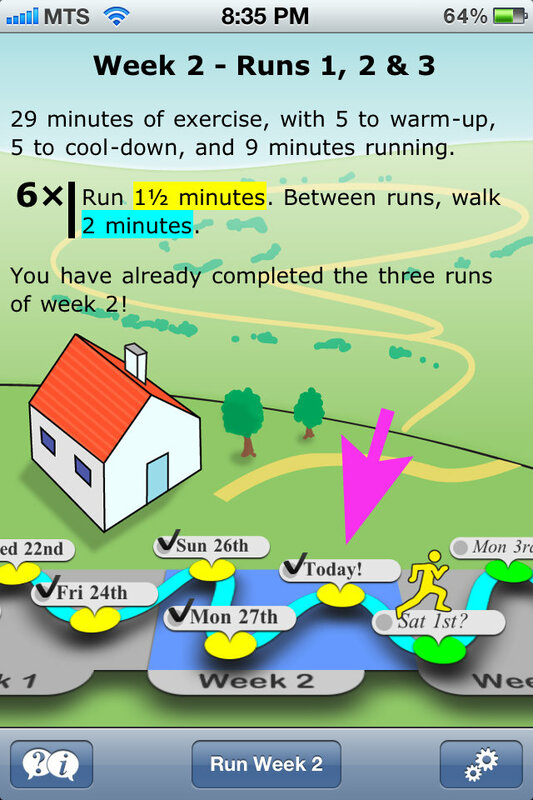 Which is actually the end of week two so I'll be starting week 3 on Friday a few days ahead of schedule. I was super excited to increase my mileage. I've been challenging myself to increase the distance covered in 30 minutes. I was at 2.08 miles, then a few times at 2.10 miles and today . . . 2.16! Woohoo! 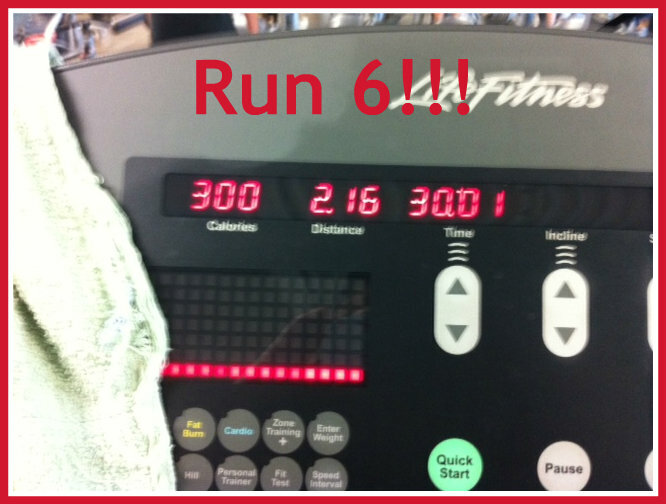 Oh and I let the timer go to 30:01 before stopping it because I really wanted to see 300 calories, hahaha! 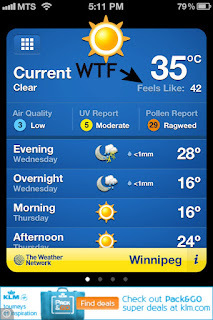 It is forty-effing-two degrees today. 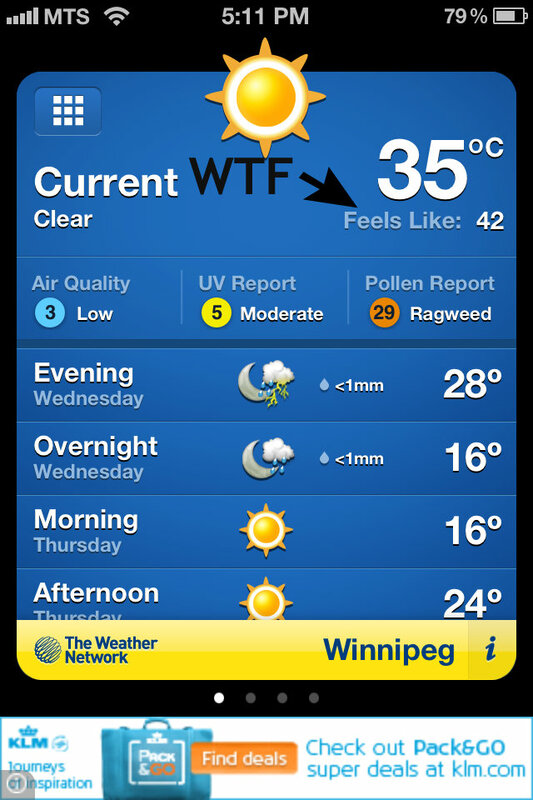 That is one hundred effing eight degrees fahrenheit. After today's run, because it was too hot to even consider making toast, I stopped at Subway. I would have taken a picture of the awesomeness that it was but I inhaled it. INHALED. 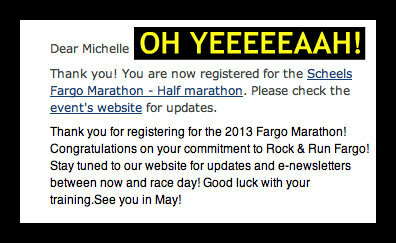 In other running news, I bit the bullet, took the plunge, put it all on the line, and registered. I had already booked my hotel room a few weeks ago because they fill up fast. I figured with a no charge cancellation policy, it was worth it to book it. But now, I've registered for the race too. Gulp. I'm doing it. I didn't want to be a one-hit wonder with the half-marathon so may I present to you, half-marathon number two!! I added the OH YEEEEEAAH! They are only mildly excited. Interestingly (sort of), I just noticed that in the picture of my shoes above, that shiny tab thing is my timing chip from the 10km Fargo race in 2010 which is when I bought them for super cheap at the expo! 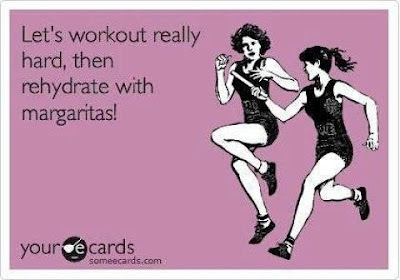 Here is my plan in a nutshell for the Fargo Marathon weekend. YEAH!! Great job registering for the half marathon! It makes it nice to have a specific goal to strive for. Good luck on your training! Thank you!! I had moment this morning where I thought "what the hell did I do?? I'm running two minutes at a time and I registered for a half??" But it passed. DO IT DO IT DO IT! DOITDOITDOITDOITDOIT!!! hehe. thank you for stopping by my blog today and for your comment! good luck on your training for your 2nd half! thank you!! I've missed you! thanks for the comment. I had a bit of ho-hum blah weekend and didn't really move AT ALL. There may have been pj's involved. A lot. Fresh week starts tomorrow!